Featured Image: “All Behind You, Winston.” Notwithstanding David Low’s famous 1940 cartoon, they were not all behind him—not at first. Chamberlain and Halifax are first and third in second row. 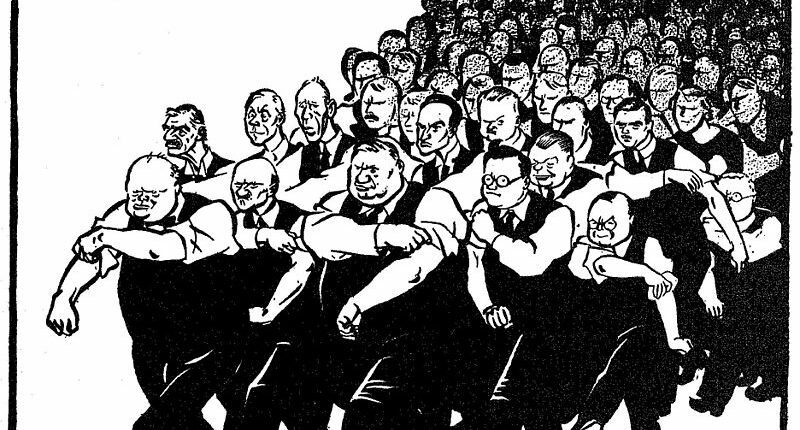 Front row: WSC, Attlee, Bevin, Morrison, Amery; Eden is behind Amery. Duff Cooper’s prominent forehead is visible behind Morrison’s right shoulder. I wanted to like this book more than I did. David Owen has cabinet experience as Foreign Secretary. His background gives him special insight into the politics behind Chamberlain’s ouster in May 1940, and Churchill’s struggle with Lord Halifax over ascertaining Hitler’s peace terms through Mussolini. It certainly did for another ex-cabinet minister, Roy Jenkins, who wrote one of the best Churchill biographies. Jenkins’ thirty-five-page account of Churchill’s rise and triumph over Halifax is second only to John Lukacs’ Five Days in London, May 1940. 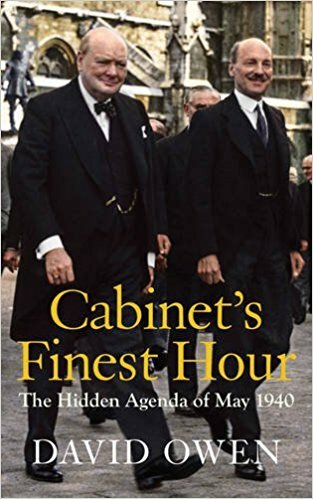 Jenkins wrote that the War Cabinet’s nine meetings over a three-day span in May was “an incidence of rare frequency.” He doubts whether there had been such intensity until 1968, when the Cabinet held eight meetings in eleven days over public spending. Owen offers many fewer such insights, although those he cites are valuable. If you’ve seen the film Darkest Hour and want to know more about the Churchill-Halifax standoff, Owen’s book is not the place to begin. It’s a book worth reading, but Lukacs and, more recently Nicholas Shakespeare, offer more detail and interpretation. Indeed Owen says he is “hugely indebted” to Lukacs. Another excellent source is Andrew Roberts’ Halifax biography, The Holy Fox. It is incorrect for Owen to claim that Churchill suffered from “clinical depression,” a term that he doesn’t define (51). Owen wrote the same thing in his earlier book, In Sickness and in Power. In neither book does he reference The Diagnostic and Statistical Manual of Mental Disorders (DSM) definition of a “major depressive episode.” Churchill never had such an episode. See also Richard Langworth, Winston Churchill, Myth and Reality: What He Actually Did and Said, pp. 197-99. 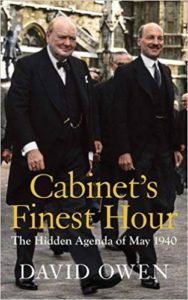 One strength of Owen’s book is Chapter 4, “The Hidden Agenda,” where he reproduces in full the minutes of the nine War Cabinet meetings. He also furnishes documents available to the War Cabinet at the time. This is a really good idea. Unfortunately, Owen or his editors confusingly place the minutes on left-hand, even-numbered pages, and the documents on right-hand, odd-numbered pages, which is confusing and disconcerting. To put yourself in the position of the War Cabinet, one naturally should to read the documents available before a particular meeting. But the documents are longer than the minutes. Reading them on right-hand pages soon forces the reader to flip to the left-hand pages where the minutes begin. How will this work in an eBook (there is one)—where you must read from page to page? Michael McMenamin is the co-author with Curt Zoller of Becoming Winston Churchill, the Untold Story of Young Winston and His American Mentor. For the past nineteen years, he has written a column in Finest Hour entitled “Action This Day,’ chronicling Churchill’s life at 25-year intervals.